This addon has saved me a lot of work on block development. Thank You! Block Designer works perfectly with concrete5 version 5.7.0.4+! Make sure you take a look at Block Developer too, it's build after 1000's of sites were created with Block Designer. Block Designer is all about creating blocks within a few clicks. You fill in a name for the block, a unique block handle and some fields or static HTML and voilá, there is your block. No need for you to copy paste code from standard blocks, code your own text input field or page selector field, block designer does that all for you. It's just as easy as 1-2-3! Once you are creating your fields, you can drag/drop a field to top/bottom or where you would want it to be. No clicking "one up" or "one down", you just drag it to the place YOU would want it to be. You click delete and a field gets thrown in the bin. Block designer is fully responsive, so whether you're at home or in your car, you can create blocks on the fly. Just login to your dashboard and create some blocks. You're looking for an Add-On that can create packages and moves your "standalone" block type(s) into your own package/Add-On? Try out Block Designer's big brother, Package Designer! "Saves us hours, and we wrote the [email protected]%! CMS! We are typically working for clients who bring their own aggressive designs to the table, so we're making a lot of bespoke stuff for a client's particular CMS needs. We find ourselves buying this block with every project. This thing just saves us half a dozen hours of leg work on any new block type." You've hit "Make block!" and you have forgotten a field (or two)? No worries! You can load any configuation for blocks made with block designer. 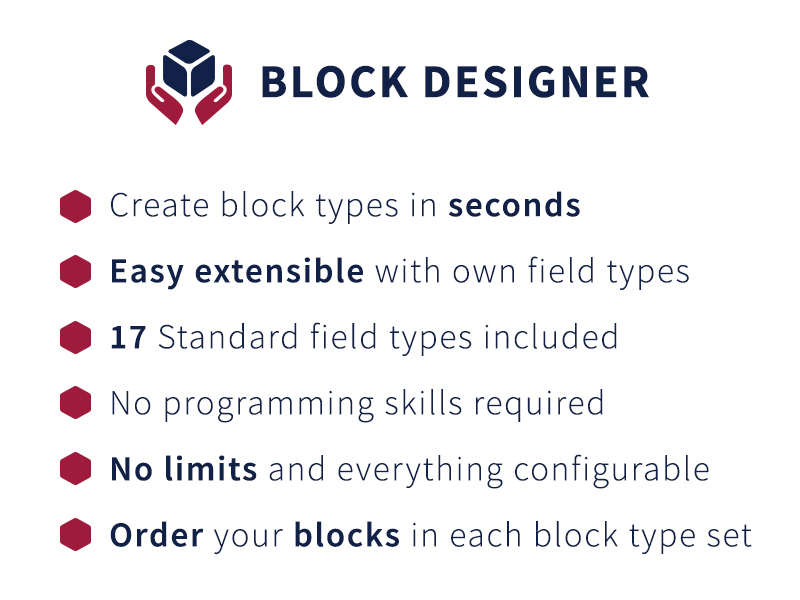 Go to the Block Config page ("Stacks & Blocks" - "Block Designer" - "Block Config") and choose a block type in the available list. This will load all your entered data (including fields). Darn usefull! Watch the tutorial video now! You can also have a group of fields that will be repeated (with their own validation) using Block Designer Pro - requires Block Designer (base). Let's say you have a block where you want to enter your (grand)children. They all have a name, date of birth (DOB) and photo. You select the "Repeatable" field type, give it the name "Children" and add the other 3 fields as you normally would. A text box for the name, datetime for the DOB and image field type for the photo of your/the child. Now select repeatable for "Children" for all 3 fields and you can add as many children as you'd like inside your block. You can even set a minimum/maximum of children to be added for this repeatable field type. I've made a video about how this repeatable works with an advanced example using a Formula 1 race calendar. Creating your own field types is really really REALLY easy. Copy paste an existing field type, change some values/functions (returns) and do your own magic. For now, happy block designing! Be sure to have the application/blocks folder writable on your FTP/server. Other than that, everything should be perfectly fine.